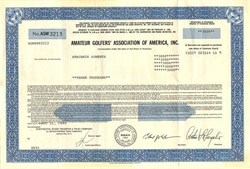 Beautiful certificate from the Amateur Golfers' Association of America, Inc issued in 1985. This historic document was printed by Security-Columbian Banknote Company and has an ornate border around it. This item has the signatures of the Company's President and Secretary and is over 24 years old. The Amateur Golf Association of America, Inc. (""AGAA""), was a company involved in promoting and staging amateur golf tournaments. Unfortunately, their product was not professional.